3 Nights and 4 Days + 2 Night Travel. Start from Mumbai evening (Bus 2 x 2 - Push back); Packed dinner will be given to each participants. Note: Trip can be customised to meet customer requirements. Arrival at Panaji at 10am. Built by Adi Shah of Bijapur on the southern most headline of the Chapora river, it was intented as the border watch post to see various Hindu raiders during the 17th centuary. Later the Portuguese took control of Goa and re-built the fort in 1617. This is the fort where the shooting of the famous Film Dil Chahta hai. You can get a scenic view of Vagator and Anjuna beaches from the southern ramparts, and of Morjim Beach from the Northern ramparts. The beach lies on the northern side of the Bardez taluka. Offering a stretch of soft white sands, coconut palms, and a scenic view of the Arabian Sea, Vagator Beach has dramatic red cliffs looking down on the shore and two fresh water springs within a stone's throw of the sea. Anjuna Beach is popularly known as the freak capital of the world. It claimed popularity for its Trance Parties and the Hippies who tried to synthesize the spiritual traditions of the East and the art, ideas and the music of the West. Anjuna comes live with its ever-famous full-moon parties and the Wednesday flea market to take one on to a trance trip. This palm fringed beach was first discovered by the hippies. Bringing hordes of European tourist Calangute beach is the haven for hippies. The beach is lined with shacks and stalls under the shade of palm trees selling everything from fried prawns and beer to trinkets made of seashells. You can also have you fill of adventure with parasailing, water-skiing, wind-surfing and dolphin trips. With a mind-blowing nightlife, bustling flea markets and generous contributions of history, you can let your spirits scale high on the sky of experience. Mormugao Harbour is 34 km southwest of Panaji. Vasco Da Gama is 4 km away. Mormugao Harbour is one of the natural harbors in the country. Its history can be dated back when 'SS Westbourne' sailed into this harbor in 1885. It is served by the two rivers, Zuari and Mandovi. Mormugao is one of the finest natural anchorages on the west coast of India and the hub of intense maritime activity. 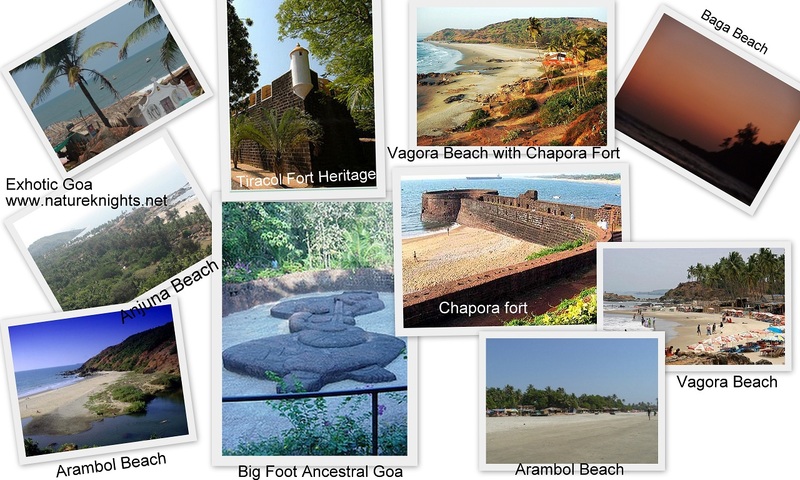 Ancestral Goa project is an effort to recreate the rural life of Goa as it had existed in the days of yore. Essentially a miniature Goan village, Ancestral Goa is the culmination of the dream and singular efforts of Goan artist, Maendra J. Alvares, who wanted to create a project that would preserve the heritage of the land and contribute to Goan tourism. The chief attraction of this open air museum is the "Legend of the Big Foot". "The Legend of Big Foot" revolves around a footprint that was discovered on a rock and the footprint is believed to bring good luck for those who stood upon it. The lateritic sculpture of Saint Mirabai in Ancestral Goa has been cited in the Limca Book of Records as the Longest Laterite Sculpture in India. This temple is one of the largest, most enchanting, serene and most frequently visited temples in Goa. The temple is dedicated to Lord Mangueshi, an incarnation of Shiva.The temple is a superb piece of architecture with a number of other attractions. Trek to Tambdi Sural Temple, Visit Spice Plantation (including lunch at the Agro farm). A 8 km long trek to the small Shiva (Mahadev) temple of Tambdi Surla situated at about 18 km from the Bhagwan Mahaveer Sanctuary gat. It is the only surviving structure of the Kadamba Yadava dynasty. Thus it is the oldest temple of Goa that survived from the Portuguese as it was set next to a stream in the middle of the small clearing, hidden in the dense. You will given a traditional welcome with a Garland and a shower of flowers and a welcome drink. Followed by a tour around the plantation with well trained guides who will explain the various spices and the medicinal use. You will then be lead to the sitting area and served a local Hindu village lunch. December early Monday in Mumbai. Note: Early morning bed tea / snack during travel in not included in the package. (Packed dinner would be given during the travel). Total Budget per head : Rs.9700/- Service + Taxes would be applicable as extra. (Kindly confirm current dated updated budget depending on the seasonality). Payment Terms: 50% advance and balance 50% two weeks before the date of the event. Local site seeing Non-AC regular bus. Special included in cost – One night Shack Party and Visit to Spice farm with lunch in Spice farm. Hotel is around 2 km from Panaji, the capital city of Goa. The hotel has elegantly appointed 36 rooms with TV and telephone. Dormitory accommodation is also available. Kitchen/dining facility is offered for group stays. A delectable choice of cuisines is served at the restaurant. A fully-stocked bar is in the premises. Doctor on call and laundry are the added services. Sightseeing and boat cruise arrangements are made at the travel counter. Any non-standard food item ordered would be charged as extra and is payable at the hotel directly by the customer. Bottled water; Aerated drinks, fruit juice etc is not included in the budget. Anything that is not included is excluded from the budget. Un-Utilised resources / services would not be refunded. Twin Sharing rooms add Rs.950/- per head. Single Sharing room add Rs.2750/- per head. If you wish to travel in AC Volvo instead of non-ac 2 x 2. If you wish to have a ex. goa package i.e. Mumbai to Goa transport/travel you would manage on your own reduce Rs.1500/- from the total cost. Authorised signatory of organisation has to sign disclaimer form on behalf of its participants. Customer will delegate an internal group leader from their sides to work close with team Offbeat Mandala to facilitate the events successfully. Ensuring Attendance during the event and other co-ordination related to their respective participants.